Wednesday 23rd March represented the 13th meeting of the CRT National Council, this time gathering in the beautiful city of Bath. One particularly positive dimension of the Council meetings is the provision of a guided tour around what is usually one of the lesser known elements of the CRT estate. 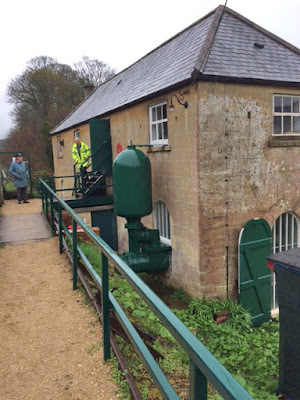 This time it was the turn of the Claverton Pumping Station on the banks of the river Avon, about three miles upstream from the town. Our visit coincided with one of those mornings when BBC Weather indicated grey cloud with two drops of rain - in other words it would be p*****g down! And on this occasion the good old BBC were spot on, not that it dampened our enthusiasm for a brief tour. 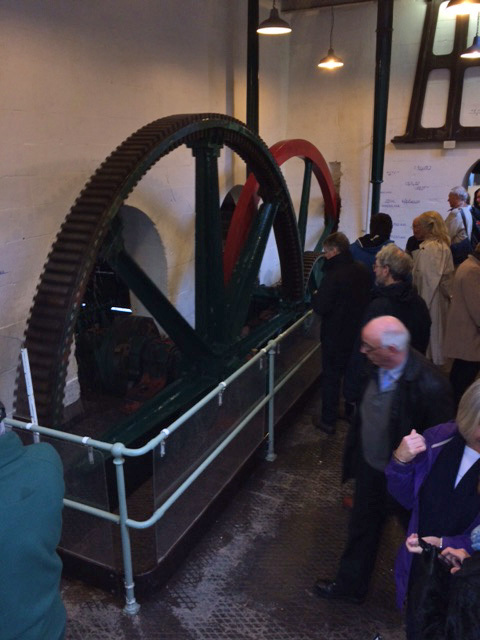 The station is spread over three levels and we entered beside a swollen mill pond which was pouring two tons of water over 48 wooden slats fixed to 24 foot wide and 17ft diameter wheel which rotates every 12 seconds. Given the fall in the river at this point there is not enough height for an overshot wheel, so instead the water rushes onto the wheel mid way up, producing more power than the sort of undershot wheel I am more familiar with from the Norfolk watermills. 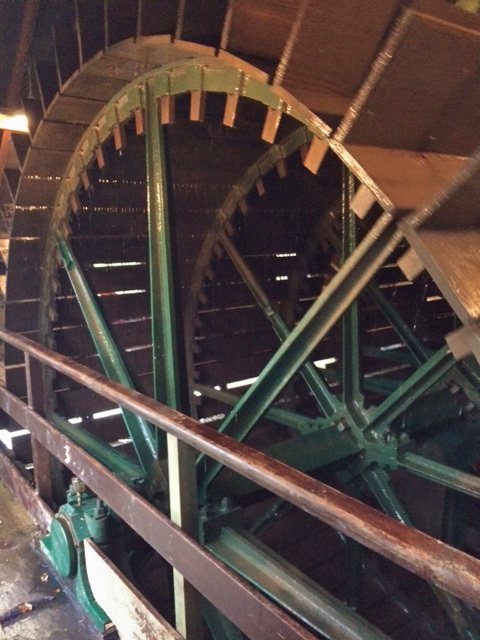 This huge wheel originally drove a traditional watermill but with the construction of the adjacent Kennet and Avon Canal an additional water source was needed. The mill was therefore converted to house a beam engine uniquely powered by water, lifting 50 gallons of water with each stroke and pumping nearly 100,000 gallons per hour 48 feet to the canal. To put that in perspective, its enough to fill two locks each hour. All this is achieved using free power supplied by the river. As a walked under the bobbing and thrusting rods I was entranced by the geometric ingenuity of what I later learned was the Watt linkage, Watts huge contribution to the development of the Beam Engine. When I got all excited about it the visitors around me gave me rather strange looks so I will try to explain the problem the linkages overcame. 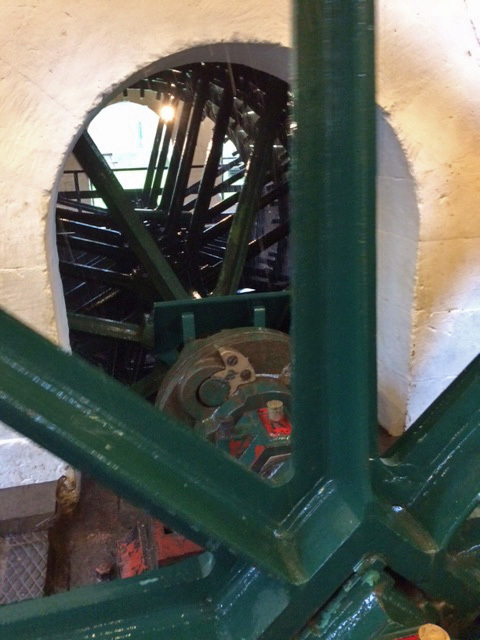 When a nodding beam engine seeks to convert power into an upwards and downwards motion for a pump it is hampered by the fact the the end of the beam arcs as it moves, so its end does not stay directly above the pump cylinder. Most engineers overcame this problem by using a cable on a rim which provides the desired vertical motion, but a cable can only be pulled, not pushed. Watts device involved two hinged bars hanging down from the beam which can swing to and fro. The alignment is then achieved by a bar attached to both the drop bars and the external framework, gently compensating for the movement created by the arc. I am not sure I am explaining this very well so you had better pay the site a visit and see it for yourself. My thanks to Phil Prettyman for the explanation. This unusual structure continued quietly about its business from its construction in 1813 till 1952 when it fell into disuse. Then a group of volunteers set about its restoration, a group which continues to this day under the watchful oversight of CRT, the site's owner. 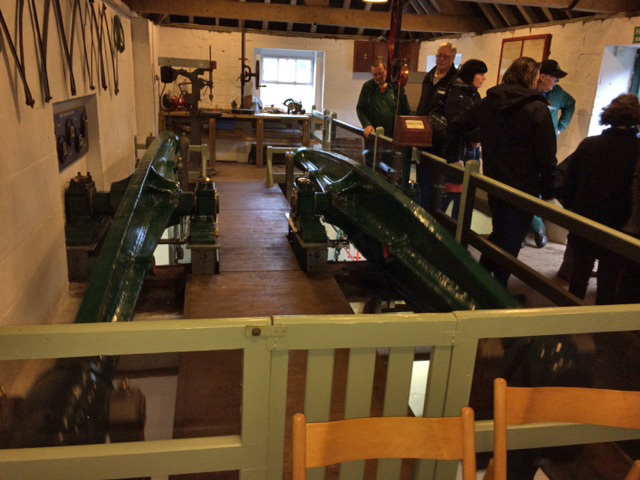 These days the mechanism is fully operational and they just need to reestablish a pipe under the adjacent railway line and they will be able to join Crofton as the second operational beam engine supplying water to the canal. This site is well worth a visit if you are passing on one of their monthly open days. Its getting to crunch time when we actually start to load all that carefully prepared stock onto the Jam Butty, ready for sale during the summer season. Its not just the size but the weight distribution and storage capacity which has been occupying my mind. A quick tally in the store room suggests something like 2000 jars / bottles will be coming with us which at about 150 jars per trading day gives us, um - about 13 days supply. Thats a lot of volume and a lot of weight. All jars have to be stored in boxes to keep them safe, and we have enough space, just. But how much will it all weigh? Nerd that I am I decided to do a bit of maths. Each 210g jar actually weighs 370g when you include the glass - so thats 740,000 grammes or 740 Kg. But as traditional boaters we spit on metric so 740 kg equals 1,630 lbs, or 116 stone which is the equivalent of 7 medium sized blokes (something I can imagine). Thats quite a lot of weight, but not so much that the butty cant carry it. It just needs to be distributed taking account of the natural list to port (it lists 2 or 3 cm and its not the fit out weight distribution, so it has to be vagaries in the construction using the remains of the iron day boat. My guess is that one side is deeper than the other. The fabricators were never convinced it was straight either and the feeling is that one side is longer than the other but on a boat which is all bows and stern, with just 2 metres of straight plate in the middle, being a "banana boat" isn't a particular problem. So, the storage has been constructed with 2/3 to starboard and most towards the middle of the boat and about 66% below the waterline for stability. Time will tell if this all works out. Its hard to believe it, but in just over four weeks we will be setting off on our epic jaunt. One level this is great but on another it highlights the need to attend to all this little jobs on the boats which remain undone. Sure, the installation of the solar panels and battery bank was a big achievement but everywhere I look there are outstanding tasks which, if I get my finger out, could be addressed before we go. So, yesterday set about one of the most obvious tasks - washing Wand'ring Bark. This may not sound too hard but our mooring is under a tree and as a result we suffer from chronic verdigris. It all washes off of but it was so bad that the gunnels had become like ice rinks in the wet. So, I ran the engine for an hour or so to get a supply of hot water and tackled the task full on. I have to admit that the improvement was immediate and impressive, even if it did highlight the flaky bits of paint here and there. Whilst the water was heating I tackled some internal jobs like fixing the pictures to the walls and most particularly, trying out the new bung in the window on the corridor. We have never really cracked this particular window from a curtain perspective as anything we have used has been snagged as we walked past either wrecking the curtain or our clothes. When we had the rest of the curtains made by Elite we asked for suggestions for this window which has a rebate of just 1cm, which precludes a traditional fabric covered porthole bung. The suggestion was a circular bit of ply with some form of tape found the edge to bake a tight fit. Not a bad idea so I thought I would give it a shot. I has some 8mm ply and with care I was able to create a circle on the bandsaw with a margin of error of about plus or minus 1mm. This was varnished and a nice curvy stainless steel handle added. To keep in in place the edge was trimmed with some self adhesive P profile draught excluder and hey presto - one bung which fits tightly in its ole. Time will tell if the slightly over tight fit continues. In addition I have been giving security a bit of thought. Last year when we were in Walsall Basin with one of the BCN Explorer Cruises on of the boats had its back deck boards lifted. Whilst nothing was taken I did clock the issue, which is a particular concern on a cruiser sterned boat. A winter of cogitating resulted in the idea to add wooden "prongs" to one edge of the board which hook under the metal surround on which is rests. On the other side I inserted a barrel lock bought from Screwfix and drilled a slot into the steel surround which the lever rotated into - making access to the engine and batteries impossible without serious crowbars. Thats four jobs down - but a long way to go. After much anticipation this weekend was nothing short of electrifying. A couple of weeks ago I bought four new 110 ah batteries to replace the two batteries which had been in place for 5.5 years, neatly filling the newly enlarged battery box, The problem was then how to wire them up in the post effective manner possible and a bit of guidance from Halfie came in handy. Then there was the small matter of sourcing the crimped wires of the correct thickness and length. Peter from Solar Kingfisher came to the rescue and quickly produced the positive and negative wiring I needed, and pointed out that as my new batteries come ready with M8 terminals there was no need for clamped attachments which can be areas of poor connection. Friday was a day of biblical rain and I took the opportunity to sit on the engine and complete the battery wiring under the shelter of the canvas awning, connecting the whole bank together and, with the aid of a set of M8 nuts and a socket set. the task was soon complete. Saturday saw me back at the boat, this time with my friend Mr G, who happens to be both an electrician and experienced in solar panel installation. Now admittedly his specialism is in the huge commercial arrays, but its all a matter of scale and he willingly offered to give me a hand. First we introduced a DC isolator switch at the fromntof the boat into which the wiring from the two panels was fed. Fortunately, there was already a 10mm hole in the bulkhead which used to carry a TV ariel, to this was recycled for our purposes. 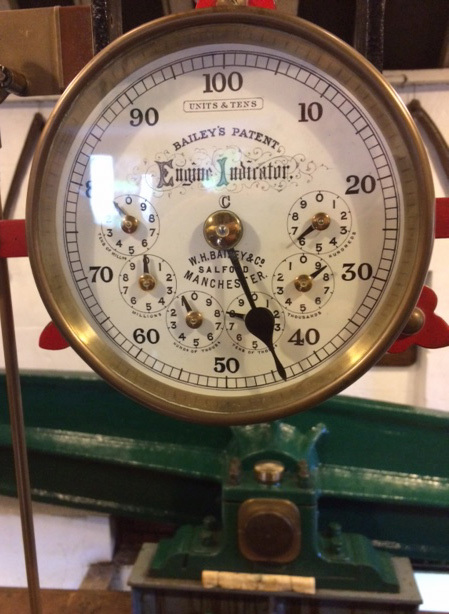 The wiring through the boat has been in place for a couple of months so our next task was to install the regulator at the stern, as near the battery bank as possible. An extra hole was cut through the bulkhead into the engine room and the battery feeds were bolted onto the battery terminals. Then, finally, a remote monitoring display was cut into the instrument panel and hey presto - we had evidence of a supply from the panels, a steady feed into the batteries and proof that the battery condition was good. Put simply - the whole set up works. But thats not the end of the story. If you remember we started on this electrical adventure to power a small isotherm freezer, which needed a new power supply and an enlarged electrical storage capability. So, Sunday saw me down at the boat again to complete the wiring to the freezer. Now it said, quite clearly, on the freezer delivery docket that the unit should be tested within 24 hours of receipt, and that would nave been in about November 2015..... so it was with huge relief that I flicked the new freezer switch was was rewarded with the sound of the compressor fan humming and the freezer cooling fast. Not content with the freezer, I also discovered fixed the hot water pipe under the sink which appears to have caught the frost and resulted in a slow drip. The pipe was repositioned and the jubilee clip tightened and we now seem to have a leak free plumbing system too. The new cruising season may still be a few weeks away but the boats are taking shape.